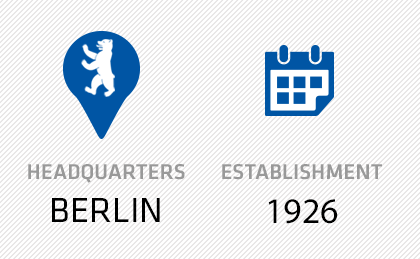 Our company HEYL Chemisch-pharmazeutische Fabrik GmbH & Co.KG is a fully independent family business, that has had its head office in Berlin since its establishment in 1926. In cooperation with our international subsidiaries, our main focus is the licensing and marketing of pharmaceuticals, as well as the sales and distribution of pharmaceutical ingredients and specialty chemicals. Our expertise lies in the specialty areas and niches. That is why, in collaboration with national and international research institutions and universities, we have developed a number of antidotes. These are highly effective drugs that are used for treating poisonings from thallium, arsenic, heavy metals (mercury, lead) or radioactive isotopes such as cesium or plutonium. The demands we receive from all over the world show the uniqueness and the medical importance of these pharmaceuticals. The majority of the pharmaceutical ingredients of these antidotes are produced in accordance with current quality controls, by our subsidiary in Thuringia, Laborchemie Apolda GmbH. 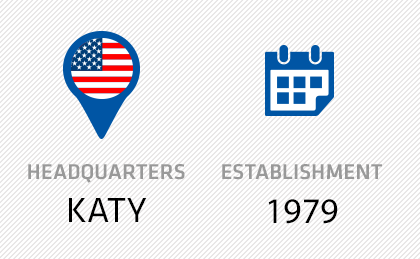 Our two sites in the USA and Japan, the Heyltex Corporation in Houston, Texas and Heyl Japan & Co. Ltd. in Tokyo, represent our company in important foreign markets. Berlin is both the German and international headquarters of the HEYL Chemisch-pharmazeutische Fabrik. Here, longstanding marketing expertise unites with medical and scientific know-how in five strategic main business areas: Poisonings, Morbus Wilson, rheumatoid arthritis, toxoplasmosis, and specific vitamin deficiencies. The company HEYL will always continue to strive for the utmost therapeutic efficiency and safety of their pharmaceuticals. Just as it has been doing so for many years, further developments of the compounds will be achieved in close cooperation with national and international research institutions and universities. By focusing on specialty areas and niches, along with a science-based marketing approach, HEYL and its employees in Berlin and Apolda aim to continue to strongly remain an independent family business with a long line of tradition. Sunrise in Tokyo, midday heat in Texas, dusk in Berlin. Three different times of day, three different worlds – yet only one name: Heyl. The reason for the success of a family run business in Berlin, that has now spread out to the western and far eastern business world, is simple: Quality prevails! 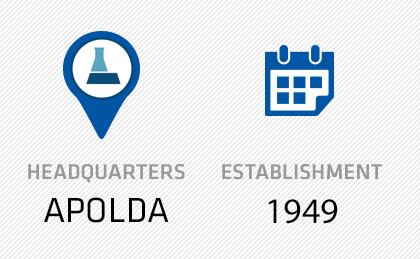 Our subsidiary Laborchemie Apolda manufactures specialty products for the chemical and pharmaceutical industry: The company, headquartered in Apolda, one of the oldest cities of Thuringia, was established in 1949 and has been a subsidiary of HEYL Chem.-pharm. Fabrik since 1993. Laborchemie Apolda is in charge of chemical procedural developments as well as custom syntheses necessary for all stages from the laboratory to production. As a result of the close collaboration with various university research institutes and research-intensive high-tech companies, all developments are based on the latest state of science and technology. Our site in Tokyo, Japan. 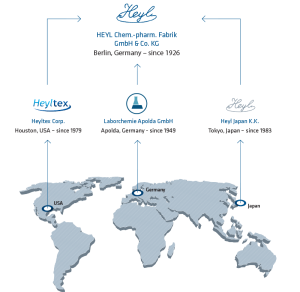 The founding of Heyl Japan Co. Ltd. as the Japanese representative of HEYL, headquartered in Tokyo, took place on 26 August, 1983. The core competencies here are also mainly in sales and distribution of finished medicinal products for the Japanese market. The most commonly known product is RADIOGARDASE®, an antidote for the radioactive poisoning from cesium and thallium.